After seeing another string of Tweets and Facebook status updates about harassment while making street images, we decided to publish links to resources that definitively state the facts on your rights to photograph. Know Your Rights: Photographers, published on the ACLU website, is a good place to start for photographers working in the United States. 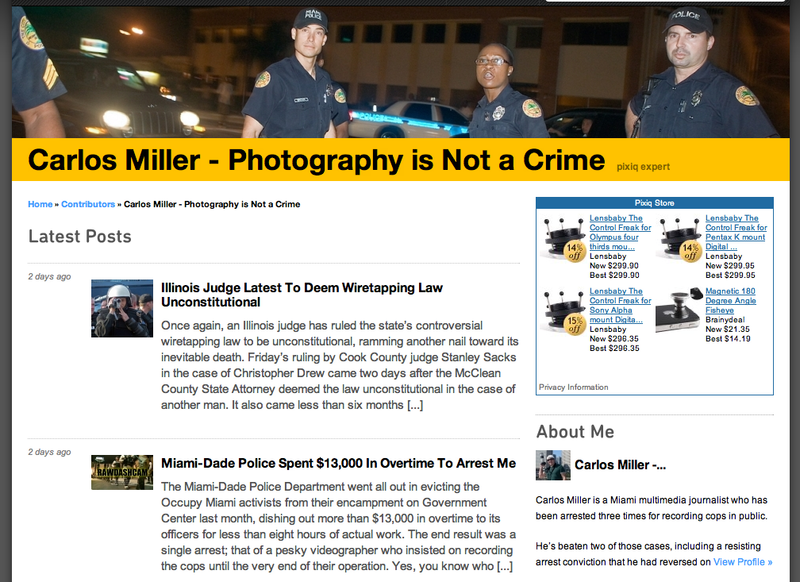 Two other articles on their site cover especially difficult situations: You Have Every Right to Photograph That Cop and You Have Every Right to Snap That Photo which covers photographing federal buildings. Two individuals in particular have written online about the legal rights of the photographer. 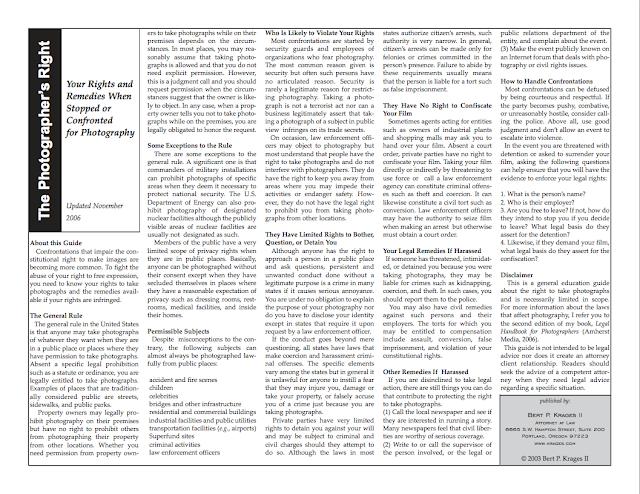 Attorney Bert P. Krages II wrote "The Photographer's Right" and his same-named "The Photographer's Right" is a PDF document that can be printed and carried while photographing. He is also the author of a book entitled Legal Handbook for Photographers: The Rights and Liabilities of Making Images. 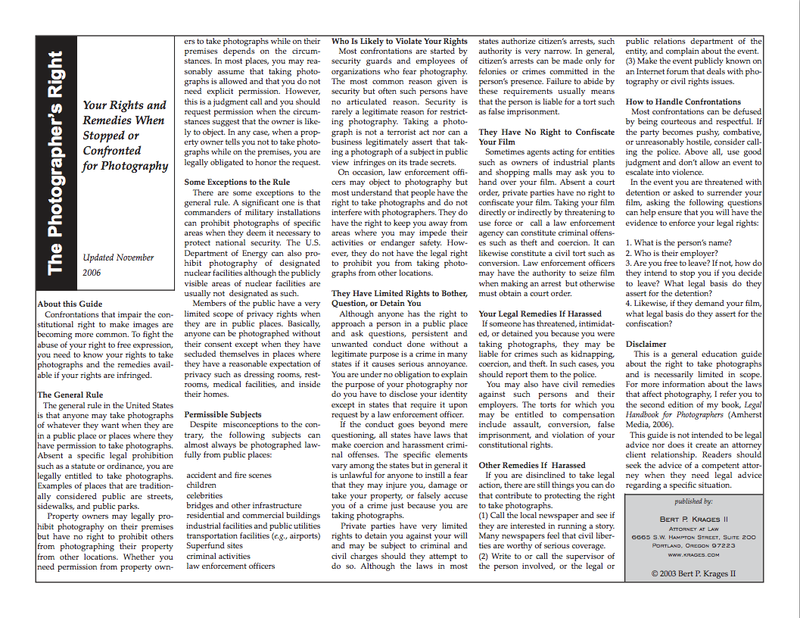 Writer Andrew Kantor released a PDF document to educate photographers on their rights, "Legal Rights of Photographers." He has also written two articles for USA Today that address the rights of the photographer, "New digital camera? Know how, where you can use it" and a follow-up article "Misinformation about your photography rights continues to spread." The blog Boy With Grenade is dedicated to "preserving the rights of photographers and educating the public on those rights." These two articles on the site summarize Kantor's work and include information about photographing in airports and photographing children, as well as asking the question of whether L.B. Jeffries was violating the law photographing his neighbors in Hitchcock's Rear Window (he was). Photojojo published an article entitled "Photography and the Law: Know Your Rights" which includes a "Ten Commandments of Photography Rights." Miami-based photographer Carlos Miller's site Photography is Not a Crime [sic] documents the violations of his rights as a photographer as well as those of others. Blake Andrews sells a Photography Is Not a Crime bumper sticker that your car needs. For other countries, you can start with these links and explore from there: Canada, United Kingdom, and Australia. Kurt Nimmo's article Your Right to Photograph talks about the difference between rights in the US and the more draconian laws in the UK. While I work on finding a definitive answer to rights in Colombia, this link starts a conversation about derechos de autor.